Pay It Forward 2011: I promise to send something handmade to the first 5 people who leave a comment. In return, you must re-post this and send handmade gifts to the first 5 people to reply. All gifts will be sent in 2011. 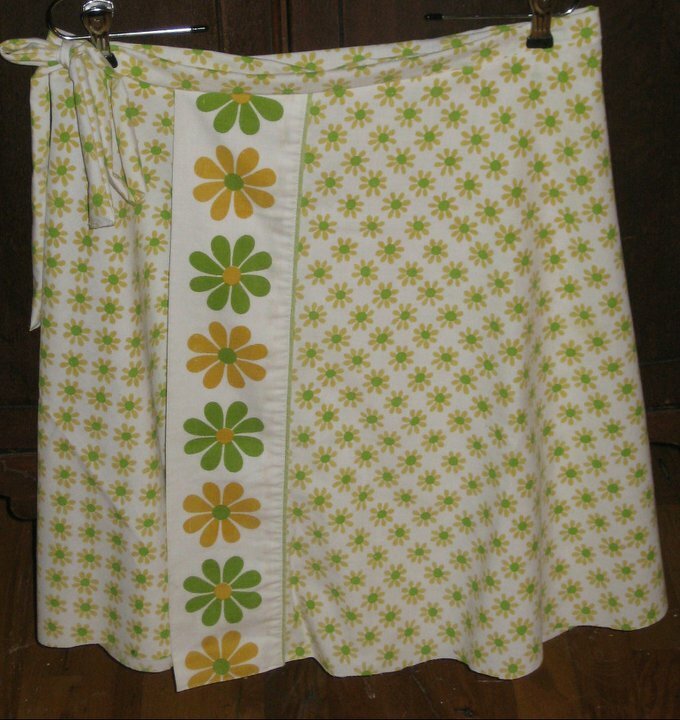 ...this great wrap skirt she made from an old sheet she purchased at a thrift store. I adore the skirt and love that it was made from repurposing a discarded item. So now I have to offer up the same promise on my facebook status. But I can't be unfocused in what I'll be making. 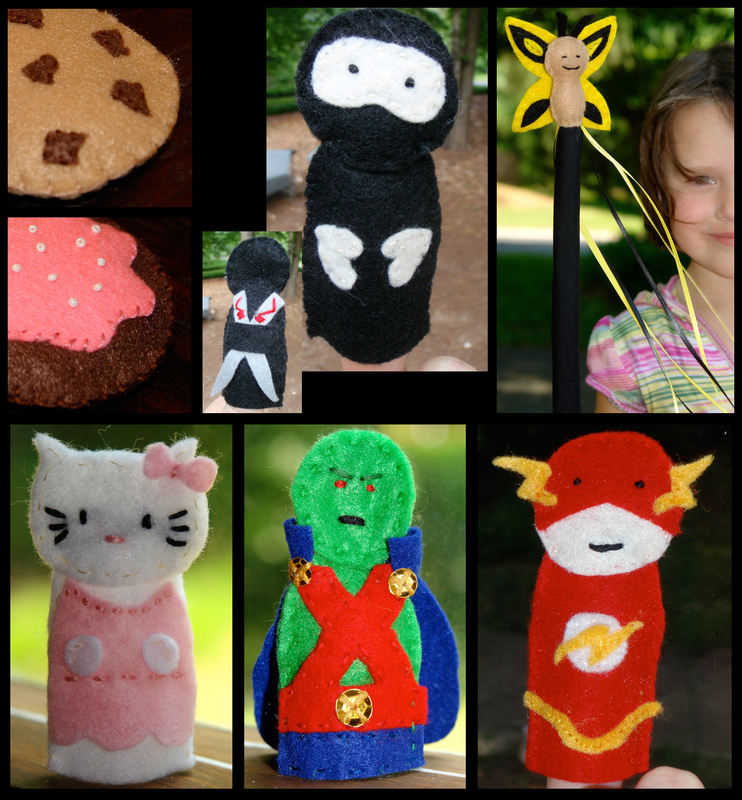 I have a lot of to do creations already stacking up on my plate, my status will specifically say I'll send the first five either a felt finger puppet or felt cookie like the ones I made this summer (shown left). I want to get back to making more felt goodies, I have the stacks of felt waiting and these don't take but long, so this will work. I'm also going to do one thing different in my post. I know many people don't deem themselves crafty or are just too busy to take on the promise. I don't want to leave them out, so for those not inclined to make something I have another way they can pledge to Pay It Forward....with free compliments. I've got everything zooming along perfectly with the Peanut Butter Blossom Cupcakes for my friend. And I'm sure that one flavor cupcake would be enough to make her smile. But I just keep thinking I should do two different kinds. I ponder what else she likes other than peanut butter and I land on pumpkin. Hmmmm. I'm not a pumpkin fan in sweets but I think peanut butter and pumpkin could work together; I put them in a tasty soup why not a cupcake. The cookies were done now it was time to try and pull off baking them inside a cupcake for my friend. I follow Bake It in a Cake on facebook and I'm constantly fascinated by the creations. Before I ever discovered BIIAC I had already thought baking sweet surprises inside cupcakes sounded awesome. And I tried to create my own Buckeye Cupcake for my dad's birthday. I need to return to that creation and perfect it. 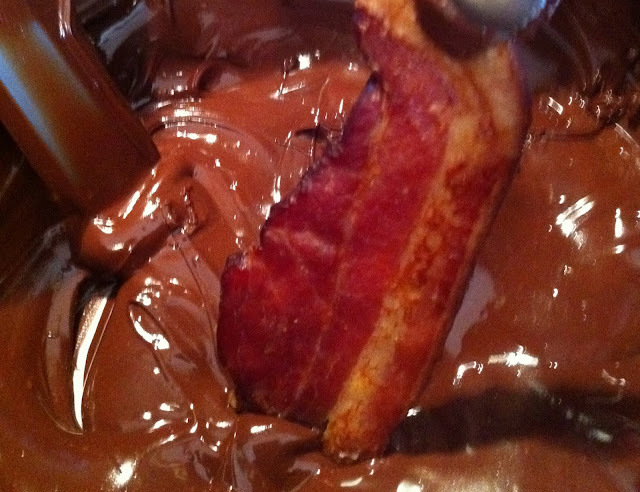 I also have a dream in my head to create a cupcake with a truffle inside that is inspired off Baileys Coffee. I digress. The task at hand is to bake my Peanut Butter Blossoms inside a vanilla cupcake. I used the cake and frosting recipe here. I didn't change a thing and I was very pleased with the result. Very. Yesterday was my friend's birthday. My friend loves cupcakes and peanut butter and I like to bake so I wanted to make her something special. Something she couldn't find in Atlanta on her annual birthday cupcake hunt. I saw these crazy cupcakes and knew I had to try and create them. The first step was baking the Peanut Butter Blossom cookies. I didn't want to use store-bought cookie dough because it tends to be too soft and thin. I needed these to holdup inside the cupcake. Bake It in a Cake linked to a cookie recipe but since I have not abandoned my quest to bake everything in the Martha Stewart Baking Handbook, I thought I'd check for a peanut butter cookie there first. No luck. The book only has a Peanut Butter Sandwich cookie. Not what I need. However, I stayed true to Martha and found a recipe on her website for Peanut Butter Surprise Cookies. They used mini Reese's cups and if I had any I would've done that too. Can you just imagine? But alas, I only had chocolate kisses. The comments on Martha's cookie indicated these would have a brownie like consistency. That sounded just right. I adore this recipe. It's adapted from Weight Watchers. I can't get my picky eater to give it a try; mixed up foods are a big no no. However, Thing Two loves it. He helped me make it for dinner Saturday night and we thought we should share it on the blog. It's really that good. So good in fact the news at the end of this post still makes me feel terrible loss. I've lived my entire life in Atlanta and that means I've not seen much snow. We had a couple of noticeable days in the early 80s when I was a kid. 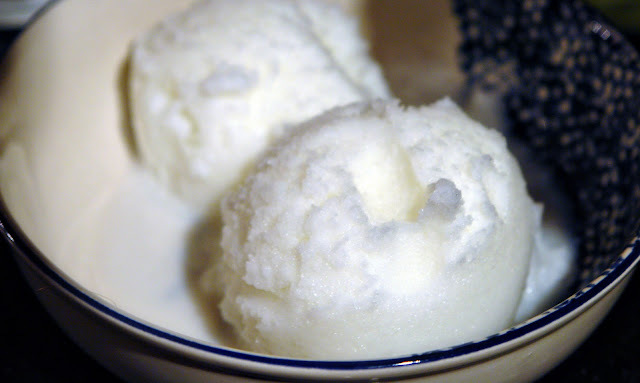 And one of my favorite memories from those days is not missing school but of my mom making snow cream. I still remember the large pale yellow Tupperware bowl she'd take outside to scoop up the snow. So this past week when we had over 5 inches of powdery snow fall I knew I had to make snow cream for my kids. I did not create this crafty bit of winter fun. I can't even remember where I first saw it months ago. A quick google search returns far too many variations to know where to credit. 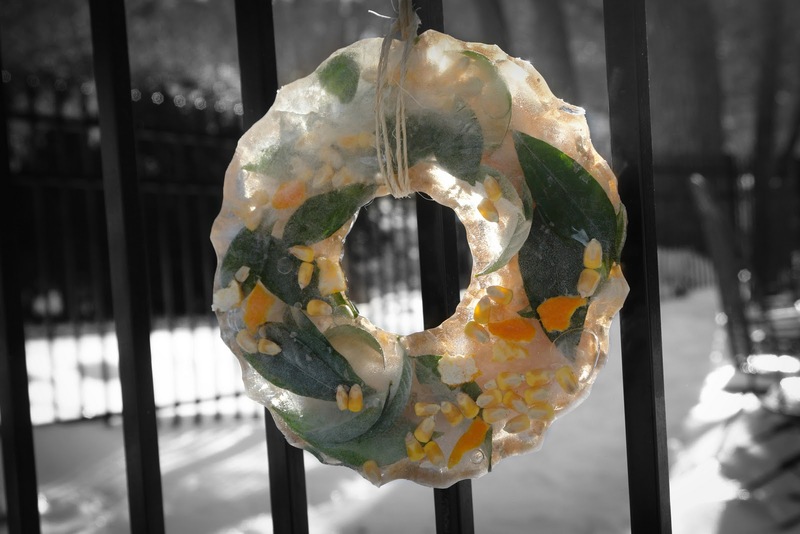 What I do know is when I saw it I thought it would never be cold enough, long enough in the south to make an ice wreath. And then my town became Hothlanta. I used one of my old bundt pans for my biggest child to create. The younger two just got glass bowls with a juice glass in the middle to create the hole. We're still in the throes of a freak snow event down here. Schools, and the city itself, are on day four of a shut down. I lived here during the blizzard of 1993 and don't remember the roads being out of commission this long at all. However, unlike in 1993, we had a lot of warning this was coming. But since snow is very uncommon in Atlanta I do not buy real winter gloves for my children. It's just a waste of money. My 10yo son only saw his first snowfall three years ago. The inexpensive $1 knit gloves at Target have served us well. Until this week. On Sunday, the day before the predicted white stuff would fall, I tried to find real snow gloves for my youngest children. I had no luck. These gloves are just not easy to find in Atlanta...especially past Christmas; we have swimsuits out in many stores, long johns, hats and scarves are already on clearance shelves. I was excited about the largest snowfall in years for my kids and wanted to have something to keep their hands dry so they could sled and play for hours. I was not to be deterred. This simple handprint wreath was part of our Advent activities this past Christmas. We're lucky enough to have my parents living just two doors down. And recently my dad's mom has come to live with them, now my kids have their grandparents and their great grandmother living close by. Great Grandma Gene's preferred holiday decor is white and blue; my mom's Christmas style is all Santas all the time. To help her feel more at home my mom found a small white tree and outfitted it with blue and white lights for Great Grandma Gene's bedroom and I thought the kids could make her something to help make the room festive as well. To make this wreath I traced and cutout three of each of my three kiddos' hands on white and cream paper; total of 18 handprints. I used a dinner plate to trace a circle on a scrap piece of cardboard and a smaller bowl to trace and cut out the middle circle for my wreath form. We don't get much snow in the southeast but thanks to this simple craft the kids have been making their own large sparkly snowflakes the past two years. All you need is boiling water, pipe cleaners, borax and a large container...easy peasy. The snowflakes really last too. This is the one my daughter made in 2009. The color faded from hanging in her window an entire year but the crystal structure remains strong. It now hangs in my laundry room since her current one took its old place in her window. Fitting spot since it's made from household laundry detergent. To make your own you're going to need some pipe cleaners. I cut 3 pieces about 5" long and another 6 pieces just under 2" long per snowflake.